After a disappointing first part of the season, Astana hope to get their campaign back on track in the Giro d'Italia where they will be led by 2011 champion Michele Scarponi. The Italian will join forces with Mikel Landa and Fabio Aru to form an exceptional trio of climbers while visa problems have forced the team to leave Maxim Iglinskiy and Alexey Lutsenko off the roster. With Vincenzo Nibali failing to hit his best form, Astana has had a disappointing first part of the season but the team hopes to turn around their fortunes when they line up as defending champions at this year's Giro d'Italia. 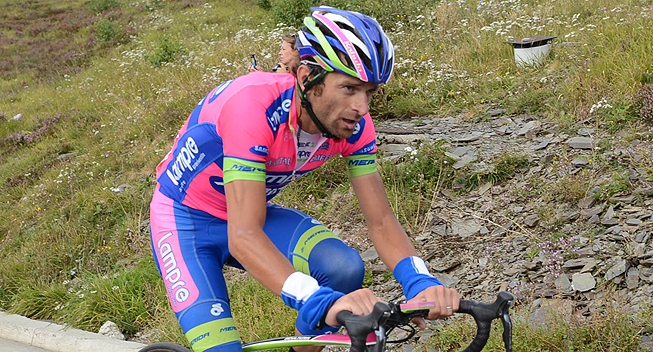 In the absence of Nibali, the team will be led by new signing and 2011 champion Michele Scarponi. The veteran Italian will be joined by Fabio Aru and Mikel Landa to form a very strong trio in the mountains. Those three riders rode excellently in the Giro del Trentino where they all finished in the top 10 after playing a key role in the mountain stages. Scarponi is the team's undisputed leader and has set his sights on the overall standings but Aru will also have a protected status as the team wants to mature him into a future grand tour winner. Landa will be expected to go on the attack in a quest to emulate his successful solo win on the final stage in Trentino. The three climbers can count on strong support from Paolo Tiralongo and Valerio Agnoli who assisted them excellently in Trentino, as well as the always reliable Andrey Zeits. Enrico Gasparotto will be looking for his first grand tour stage win after delivering a below-par showing in the recent Ardennes classics. The team had hoped to also line up Maxim Iglinskiy and Alexey Lutsenko but visa problems have forced them out of the race. They will be replaced by Janes Brajkovic who is yet to return to his best form after several years of struggles, and sprinter Borut Bozic. “We come to the Giro start in Belfast, Northern Ireland with MIchele Scarponi to rally around as the race moves south through Dublin and back over to Italy for challenging days ahead at Sestolo, Monte Zoncolan and the wine country individual time trial into Barolo," manager Alexander Vinokourov said. “Maxim Iglinskiy and Alexey Lutsenko submitted passports for UK visas to the British embassy in Paris on April 17. They received no response after two weeks, nor were their passports returned, leaving them off the roster and then stranding them in Nice, away from their families in Kazakhstan. “Both Kazakh riders were training specifically for the Giro and will be replaced by designated reserves Borut Bozic and Janez Brajkovic of Slovenia. “We are disappointed to leave two of Kazakhstan’s brightest cycling federation riders off the World Tour Giro roster, and find the silence and the non-response of the British Embassy in Paris in such a contrast to the efficient work done by their colleagues in Germany for our processed and registered Kazakh rider Andrey Zeits."